This document will walk you through the biometric enrollment process. You will need a list of the students with pin numbers. The biometric software must be installed on your computer. A network connection to the server is needed during the setup and uploading the images, but not while enrolling students. Select the on your desktop to launch the enrollment package. Select Save to save these settings. Select Load to pull the customers down from the server to the biometric software. You will get a message telling you what you are about to do. Select Yes to this message. You will notice the Customers, listed at the bottom, will go from 0 to the number of students in your system. Click enroll, top left, to begin the enrollment process. They should apply a small amount of pressure, but do not press real hard because this will distort the finger image. The screen will tell you if the positioning is incorrect or it will say remove finger if it has been accepted. Scan the left finger 3 times. Notice in example below, you see well defined images and there is a green bar at the right. Make sure the green bar is reading a minimum of 33% for an acceptable image.If you are having a problem getting a good reading, have the student swipe their finger across their cheek to get the oils in the grooves to get a better image.Make sure the hands are not wet or covered in food. A new screen will come up after the last image has been accepted, telling you to place your right index finger on the screen. Follow the same steps with the right index finger. When the enrollment has been completed, you will see the student's name in a list with their pin number. Verify that the name and number are correct. If you have the option to verify the enrollment checked, another screen will pop up asking the student to scan their finger again to test the enrollment. This will display a message asking if you want to delete the file, Say yes so as you enroll you are not continually updating the same images. Once the images have been uploaded to the server, you need to go to each POS machine and download them to Morphosoft. In the system tray of the POS, should be an icon that looks like a red diamond with a black fingerprint behind it. Click on this icon to open Morphosoft; Pictured below. When the download is complete, you should see that the Fingerprint Database Size has increased and a list of names will appear in the Download Results box. Make sure that morphosoft says it is connected, on the top left before you minimize it. If it is not connected, the biometrics will not work when you are cashed into the POS. 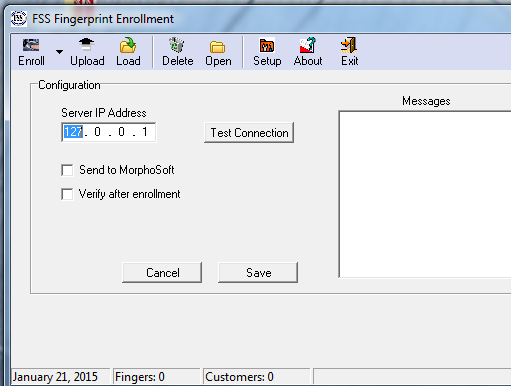 In the Morphosoft Program, Select Schedule Fingerprint Updates and set a time and how often you would like the system to automatically download biometric images. This will update once the machine is turned on. Select Minimize to close morphosoft to the system tray.